Chennai: Amid indications of a possible succession war within the party, the DMK on Tuesday rallied behind its working president M K Stalin, the son of late party chief M Karunanidhi, saying he would take over its leadership soon. Duraimurugan, the party's principal secretary and long time aide of Karunanidhi, said Stalin had all the skills to lead the party. He was speaking at an "urgent" meeting of the party's executive committee here to mourn the death of Karunanidhi, Duraimurugan. 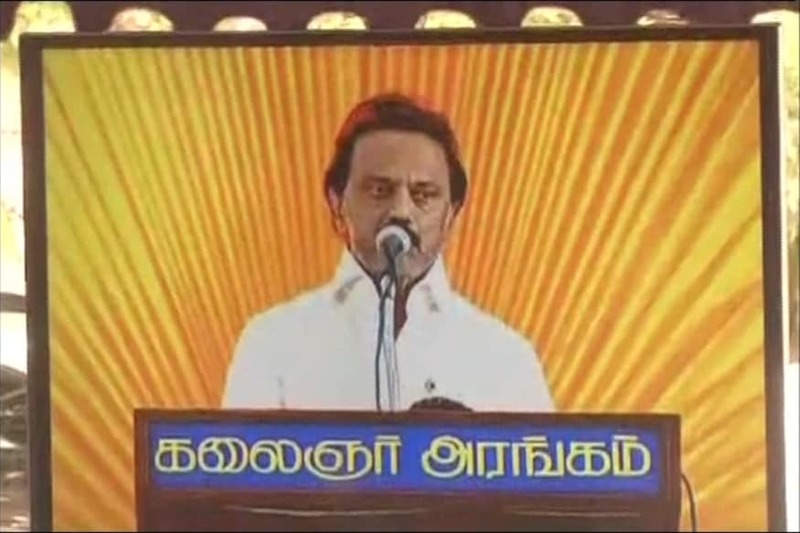 "Dear Thalapathi (commander), who is soon going to become (DMK) president, we are prepared to follow your orders... lead us," the senior leader said addressing Stalin as the DMK workers cheered. Stalin is fondly addressed as "Thalapathi" in the party and is expected to take over the DMK's reins after his father Karunanidhi's death on August 7. "You have all the skills… you have the skills of Anna (DMK founder CN Annadurai), Kalaignar (Karunanidhi) and yourself. There is nobody in Tamil Nadu who can defeat you," he said. Party workers raised slogans hailing Stalin soon after Duraimurugan said the working president would graduate to the party's leadership role. Duraimurugan's statement comes amid indications of a possible succession war in the Dravidian party, with expelled DMK leader and Karunanidhi's son M K Alagiri claiming that the true supporters of his father were with him. Signalling resumption of the family feud over Karunanidhi's legacy days after his death, Alagiri, estranged from the family, had claimed on Monday all loyal party workers were with him and that the DMK would "dig its own grave" if it does not take him back. The Karunanidhi family had presented a united face when the leader was fighting for his life at a city hospital. Alagiri was present at the hospital and was also seen at his father's funeral. Praising Stalin, Duraimurugan said he had traits like "concern, skills and hardwork." "Crores of party workers are with the working president in his efforts to steer it," he said. Though Stalin sits firmly in the saddle and his ascension as DMK president seems to be only a matter of time, Alagiri's tough posturing may prod his supporters in Madurai and adjoining districts to come out openly against the new chief. Meanwhile, DMK deputy general secretary Subbulakshmi Jagadeesan accused the BJP of trying to "divide the party" and stressed on unity in the party for its well-being.